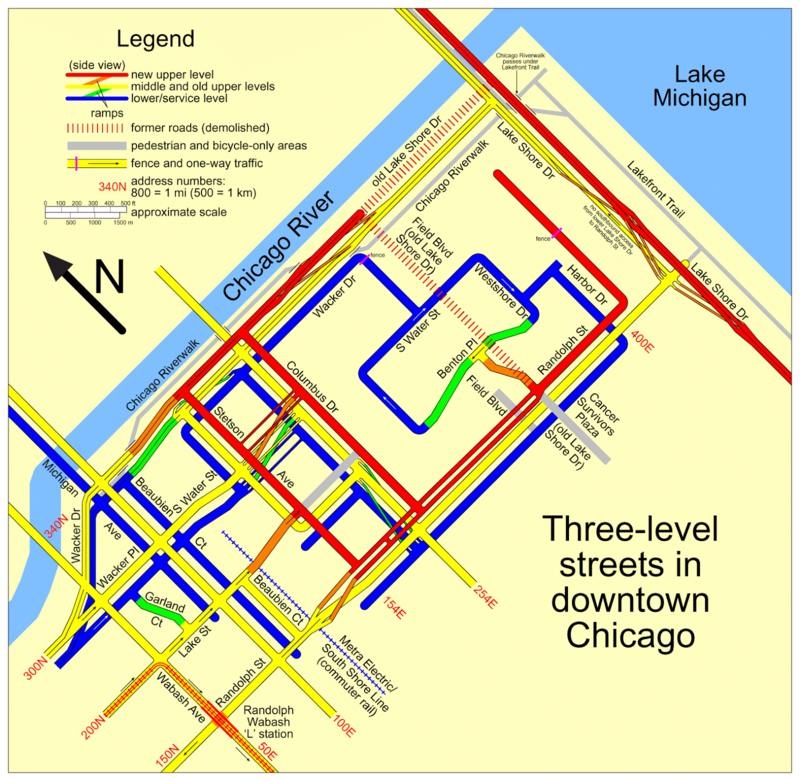 The Digital Research Library of Illinois History Journal™: Why Chicago has Multilevel Streets. 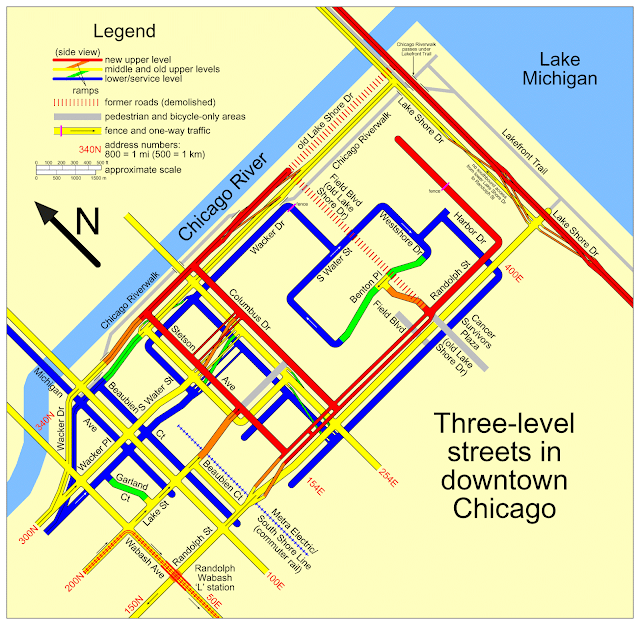 Downtown Chicago, Illinois has some double-decked and a few triple-decked streets immediately north and south of the Main Branch of the Chicago River and immediately east of the South Branch. CLICK THE MAP ABOVE FOR A FULL SIZE, ZOOMABLE VIEW. The most famous and longest of these is Wacker Drive, which replaced the South Water Street Market upon its 1926 completion. The resulting bi-level street has an upper-level riverfront boulevard, a lower-level roadway for commercial and through traffic, and a recreational walkway at water level. Upper & Lower Wacker Drive on the Chicago River. 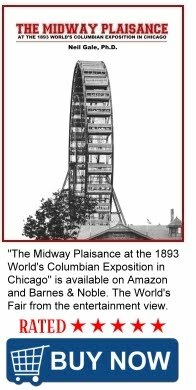 The raising of Chicago streets began in 1858, when streets and buildings were raised between four and seven feet above their former elevation, just a few feet above lake level which was constantly muddy. The higher elevation allowed for sewers and proper drainage. However, this did not produce any two-level streets; the first of those was Michigan Avenue in the late 1910s. When the Illinois Center development was built on the east side of downtown, a new upper level was built, making most streets in that area three levels. The double-decked portion of Wabash Avenue north of the Chicago River was built in 1930, in conjunction with the single-level Wabash Avenue Bridge. 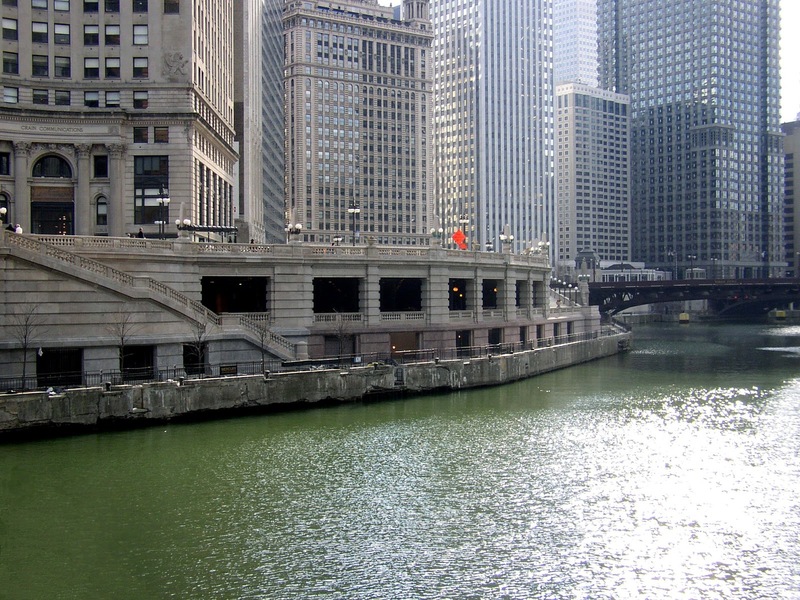 On January 3, 2005, the upper and lower levels were closed at Kinzie Street for reconstruction (in conjunction with the Trump Tower Chicago development) and have since been reopened to traffic.